Late in the evening hours on Friday, June 3rd, the Diamond Mine practially exploded. Everything had pretty much ground to a standstill, and very little trading had happened for a week or so. That is until 9:00 PM EST. I went into that day with seven cards and about 40 completed trades. I ended that day with 17 cards and almost 70 trades. Things started out with an extremely benign trade for a 1999 Alomar that yielded a 1998 Molitor. In itself, not too exciting. Both HOFers, but nothing spectacular. Then IT happened. I refreshed my trade screen and someone was offering 11, I said ELEVEN, cards for that 98 Molitor. The first card showing was a 93 Mo Yawn. Meh, I thought. 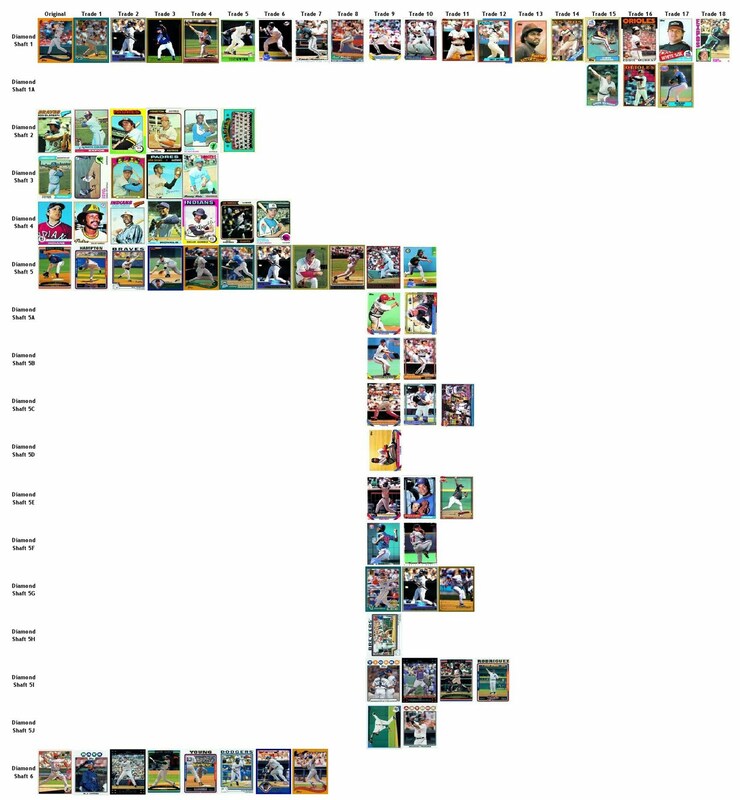 I expanded the selection and then saw more 93 Who's-thats, then I spied a 96 Pedro Martinez. Ok, that alone makes it a doable trade for me. Next I searched for the REQUIRED 1997 card to continue the mining adventure. The last card on the page was a '97 Bobby Bonilla. Bingo. Not that the Bonilla made me take the trade, but it satisfied my quest. I accepted the trade, and then immediately thought, "Why would someone offer 11 cards for a '98 Molitor?" Then the horrifying thought that someone mistakenly selected "All" on the trade screen, and I just emptied someones cache. I immediately felt remorseful. I read the FAQ and saw you can't void a trade, so, I decided to make the most of it. I must say that's NOT TOO BAD for a 2006 Andy Marte. That's also a pretty good start to a pennant winning team. As far as the other cards, I'm on the precipice of the 60s. My 1971 Ollie Brown became a 1970 Manny Mota. Nice. And I also landed a 1972 Padres Team Card, which was originally a 1977 Rod Gilbreath. Sweet. Here is the new graphic. It's gotten so big, I've had to splice it from two screen grabs. Yikes. One day, I'll lay out each "shaft" individually and let you vote on the greatest improvement, which I'm sure the 2006 Andy Marte will win.